Sometimes when I'm hooking up Evie's g-tube in the food court in the mall, I look around to see if anyone is watching. I still brace myself when someone shows interest in what we're doing. I have no idea what they will say or conclude, but I do my best to explain why she has a feeding tube in a practical way. Listening. Parents who are just starting on this process have a lot on their mind. They have concerns and they may not know all the answers yet. When Evie just got her g-tube, we were having trouble figuring things out post-NICU stay, and answering questions about the g-tube so early on was very hard for us. But as we talked about it later with friends, it helped us to better formulate (in our sleep-deprived state) what questions we needed to ask the pediatrician. Helping by doing other chores. Cooking, straightening up, taking care of our other children. Cooking and cleaning were so helpful to us in the early days. We are indebted to both of our moms for coming to stay with us in snowy New England and cooking and cleaning for us. fully understand the situation. I am still navigating this. I am the one who takes Evie to her feeding and GI specialists and I think day and night about her feeding. In my spare time, I am looking up ideas for food on Pinterest or reading the comments of other tubie families on a Facebook group. Advice is nice, but when it comes from someone who doesn't know about g-tubes and feeding difficulties, it doesn't have the same effect. Asking questions is fine. Just be mindful of our feelings. This is our child. I am totally ok with questions. It shows people are interested. But sometimes the answer is so long, that it takes me a moment to figure out what to say. Some good questions to ask are: How are you feeling about her feeding these days, or How is she doing with trying new foods. Talk directly to an older child. He or she may be able to answer questions. get in calories and hydration. The first time I explained Evie's feeding tube to a young child, I just matter of factly said that Evie didn't eat enough using her mouth, so we had to use the tube to get food to her stomach. The child accepted this and went off on her way. It was that simple. Learning more. Try to understand the child’s medical conditions. a child couldn’t breathe well enough, you wouldn’t hate the oxygen tank. This is an important one for me. More than anyone, I want her off the feeding tube, but right now it is a blessing to us, and I appreciate everyone treating it as such. It is what makes her look so strong and healthy right now. It is what enabled her to be strong enough to have heart surgery. It is what got us out of the NICU, because otherwise we might still be there today! fine, but don’t feel bad for our child if he or she is unable to eat certain foods. Evie's birthday is coming up, and she will get a smash cake just like anyone else. She won't eat the cake, but I sure hope she will eat some of the frosting! Help us find ways to make gatherings about more than food. This isn't as big a deal for us right now. We want Evie to notice that people are eating, and that they enjoy it. issues that often can’t be seen. No one has said this to us, but I can see how this would be really frustrating for another parent of a tubie. different medical history and conditions. When someone gives me advice, I listen and then sort out what might be helpful and what is not as applicable to Evie. I need time to process and feel comfortable about trying new things with her. bathroom, or not fed at all because of social concerns. Thank God no one has said this to us! I think I would either cry or want to punch them. This tops my list of most unhelpful things to say. have dietary restrictions or are unable to eat food safely by mouth. This one is so important to me. With Evie's history of aspiration and her low oral muscle tone, I am pretty sensitive about what she can and can't eat. Just the density and weight of the food we give her can make her gag. She still has thickened fluids because it is hard for her to coordinate her swallowing quickly enough for liquids like water. If you've read this far, thank you! If you've asked me any of these questions, please don't feel bad. I hope this helps you know how to help us in the future. Q: What is she eating these days? A: Evie is enjoying a luxurious taste of different foods. She eats expensive Siggi's kefir yogurt and Mommy just used a Baby Bullet for the first time to make her Asian pear puree and sweet potato puree. She is still unable to eat lumpy foods without gagging, and because we don't want to create oral aversion, we are slowly introducing lumpier foods. 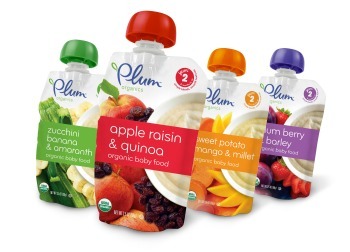 She eats a lot of Plum Organics pouches, and loves berry flavored things just like her mommy. Q: How much does she drink? A: Not much. Maybe two sips of formula if we are lucky. We've mixed in yummy things, changed formulas, tried different temperatures, and she just doesn't want to drink. Thankfully, she lets us spoon feed her, but that doesn't give much volume, so we end up giving the rest by g-tube. Q: When will she get off the g-tube? A: It's going to be a long journey. For some kids, it takes years, and for others it takes months. We are currently switching to a supplemental formula to see if Evie will get hungrier with less volume, but need to make sure she still gets enough calories and hydration. This question stresses me out and makes me feel like I'm not doing enough to get her off the g-tube sometimes. But we can't rush Evie--she has to feel like eating is fun and that she wants to eat. This means stopping her oral feeding even if she's only eaten 2 good bites, and then trying again after a break, but not forcing her. Right now we are up to about 5 good bites a meal. 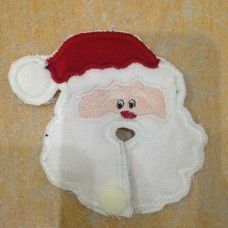 Tubie button cover in the holiday spirit! Merry Christmas from Evie and her mommy!